Dreaming in Blush: 3 Homemade Beauty Treatments: Valentine's Day Recycle! 3 Homemade Beauty Treatments: Valentine's Day Recycle! Valentine's Day may be over, but that doesn't mean the fun has to be! If you have a spare rose lying around, or maybe some extra strawberries from a chocolate covered strawberry experiment, then these at-home beauty treatments will be perfect for you! 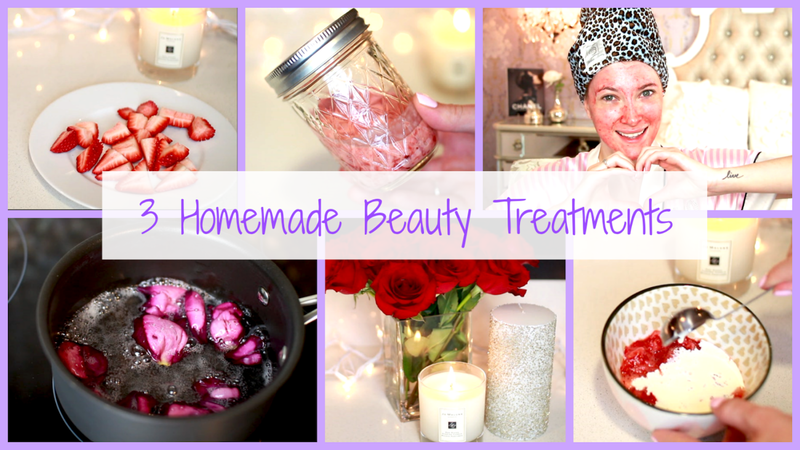 These treatments don't have to be used only around Valentine's Day either... if you get some strawberries in the future and want to learn how to make them into fun beauty treatments, just come back to this post! "Strawberries and Cream Face Mask"
Combine 4 Strawberries, mashed up with a fork, with 1 tablespoon of heavy cream and a dollop of honey. The heavy cream is great for dry skin, but if you have normal skin you can substitute sour cream instead, and acne-prone skin should go for plain greek yogurt. Mix it up and apply to your skin for 10-15 minutes, avoiding your eye area. If you have a strawberry allergy raspberries can be substituted for the strawberries. This mask works well because strawberries have natural Salicylic Acid, Vitamin C, and Alpha Hydroxy Acids that can help clear up your skin and lighten hyperpigmentation. Heavy cream is super nourishing so if you have dry skin like me it is incredible, and both sour cream and greek yogurt are filled with lactic acid, which will help gently exfoliate your skin and help clear it up. Honey is amazing in any skincare treatment; it's a natural humectant which means it is incredible at retaining moisture and helping naturally heal your skin. Plus, it's anti-microbial which means it can also help clear up any acne or irritation. Raw honey is definitely better, but the packaged stuff will still be moisturizing and will work in a pinch. "Coconut and Rose Hail Oil"
Melt 1/2 cup of coconut oil in a pot, and then add in 2 tablespoons of rose water and 1/2 cup of fresh rose petals (this is about half a rose worth of petals). Bring it to a low boil, and then continue cooking for 3 more minutes. Remove from the heat and let it cool before straining it through a coffee filter. Apply the oil to your scalp and hair, and then wrap it up in a towel for 20 minutes or so before shampooing out. I used my wrapadoo for this step because it's softer and more gentle than my regular towels. I adore my wrapadoo, and have used it for several months now, but I just realized after posting this video that I have been wearing it backwards all this time! There are instructions on the site on how to properly wear it, and it's unique from other hair wraps because you don't flip your head; you just put it on like a hoodie. Which probably explains why I have been wearing it wrong all this time… it goes against your natural instinct of how to wear it, but apparently it's much better for your hair this way. Rose water can be found at health food stores, but if you can't find any or don't have any on hand you can quickly whip up your own for this recipe. To make rose water you just need to put 1 cup of rose petals into a pot, cover with about 1 inch of water, and let it simmer on a low heat until the petals lose their color. This took me about 15 minutes. The low heat is important here... if the heat is too hot you will lose some of the properties of the rose water, so make sure to let it simmer. The hair oil works because both coconut oil and rose water have nourishing and healing properties that are both gentle and affective. Coconut oil is notoriously good for your hair and scalp, but the benefits of rose water are less well-known. Rose water helps promote hair growth, revitalizes the scalp by enabling smooth blood flow, helps prevent inflammation, strengthens the root hairs, and acts as a lightweight conditioner. On top of this it helps maintain the skins natural ph balance, which in turn will make everything more balanced, and you definitely want that - especially on your scalp where you are likely using harsh shampoos several times a week. Please use organic or hand picked roses - if you buy them from a giant supermarket chances are they will be covered in pesticides! Combine 7-10 strawberries, mashed up with a fork, with a teaspoon of olive oil, a teaspoon of vegetable oil, and as much granulated sugar as needed to make the mixture gritty. Apply this to your entire body in circular motions, and then rinse off. I would apply this in your shower as it is very messy and sticky, but it works really well! Your skin will be so soft afterwards. I hope you guys enjoyed this video, and if you try any of the treatments let me know in a comment! I loved this video Elle! I really want to try all three of the treatments, but I think I'll do the strawberry mask one first! I really want to try this! It's the perfect way to use strawberries that might have gotten too mushy! Awesome DIY ideas :) I'm definitely going to make the body scrub! Amazing recipes! I wanna try out the face mask, it sounds great. LOVE the idea of reusing valentines day things! So do idea, it's very creative. I love oyur blog, I was wondering it you could check min eout? Sound like really great DIY treatments! Strawberry mask, that sounds wonderful. Only just read this and now I really want to go and buy strawberries and cream...but to eat not to put on my face! Haha that probably isn't what you're aiming for! All of these ideas are such cute! Thanks Elle! cute ideas! I'll have to give these a try! I love these so much! I'll need to give these a whirl! I can't wait for you home to be finished. I hope you'll do an updated tour! definitely gonna try Strawberry Sugar Body Scrub! Homemade beauty treatments are the best! Elle, I have been watching your videos for years now.. AND I LOVE THEM! I loved these ideas, def something I would like to try! Hi! nice bog. I´m following you now. Would you like to visit my blog and follow me back? Love the idea of homemade beauty treatments. :) Need to try them. Great post, would love to hear your feedback on some of our latest tips and trends on Beauty & Soul!